I love beautiful backdrop to this Indian bride and groom's sweetheart table at the Montage Resort in Laguna Beach, California. Created by Fayaz at Bloom Box Designs, the backdrop made use of shelving, candles and flowers to create a magnificent focal point behind this stylish couple. More and more Indian brides have been choosing unique ballgowns for their receptions, and this bride was no exception, choosing a purple creation that was a true showstopper. The ballroom decor was done in purple, silver and cream, and it was just a stunning palette. Even the groom's tie is silver. Coordination provided by Nikki Khan at Exquisite Events. 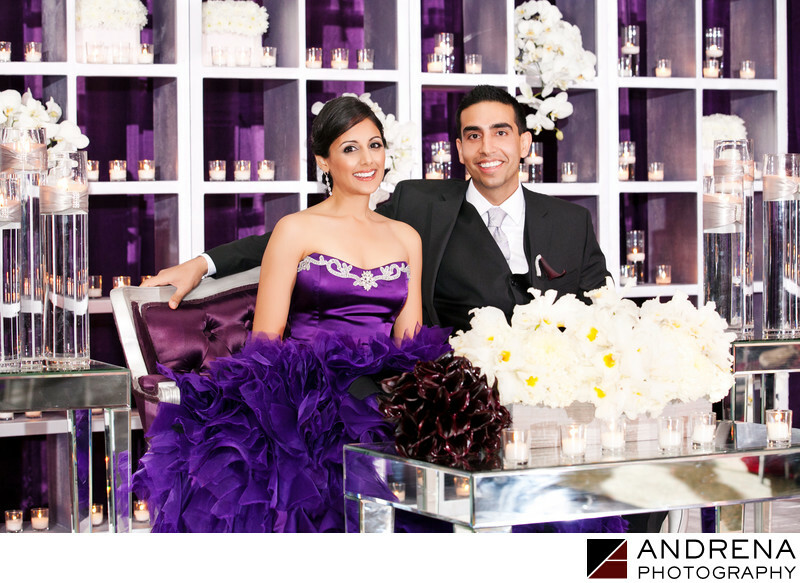 This wedding was also published in Maharani Weddings Magazine. Indian wedding photographed at the Montage Resort in Laguna Beach, California.